1. Fryer Safety/Preparation – For safety, you should wear long sleeves and oven mitts, and have a BC or ABC fire extinguisher on hand. Locate a safe, outdoor area away from your home to set up the turkey fryer on a hard, flat surface. The fryer can be placed on a large piece of cardboard to catch any spills; make sure the fryer remains level. Fill a 30-quart pot with 3 gallons of peanut oil. (Peanut oil is recommended because it can be heated to high temperatures before it begins to smoke, which could impart an unpleasant flavor.) Cover the pot, slide the deep-fat thermometer through the hole in the lid (or attach a deep-fat thermometer to the side of the pot) and light the fryer. Heat the oil to 375°F on medium-high heat. The fryer should be attended at all times, especially since most fryers have an automatic shut-off valve that requires the fryer to be relit every 15 minutes. 2. Turkey Preparation/Attaching Turkey Hook – To prevent the oil from boiling over and ensure even cooking, make sure the turkey is completely thawed. Remove and discard the giblets, neck, liver and any ring binding the turkey legs or pop-up timer. Rinse the turkey with cold water, and pat inside and outside of the turkey dry with paper towels. For a 12- to 14-pound turkey, sprinkle the entire inside and outside of the turkey with a mixture of 2 teaspoons each salt, dried basil and dried oregano leaves, and 1 teaspoon each ground black pepper and garlic powder. If your fryer has a turkey hook, place the turkey hook on its side. Slowly slide the hook into the turkey, breast cavity first, with the hook coming out the opposite end of the turkey. If your fryer has a basket, place the turkey in the basket with the legs pointing up. 3. 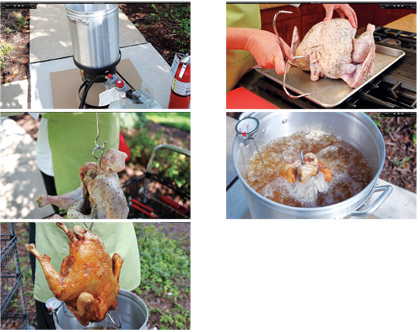 Deep-Frying the Turkey – Turn off the burner, put on oven mitts, attach the lifting hook to the turkey hook and lower the turkey into the hot oil. Remove the lifting hook. The oil temperature will begin to drop. Relight the burner; do not cover. Attach the thermometer to the side of the pot. While frying, maintain an oil temperature between 325° and 350°F. If the temperature drops below 325°F, adjust the heat or place the lid on the pot briefly to bring the oil back to temperature. Fry the turkey for approximately 3 to 3-1/2 minutes per pound until the internal temperature reaches 170°F, or 40 to 50 minutes for a 12- to 14-pound turkey. 4. Removing Turkey/Storing Oil – When the turkey is done, turn off the fryer and reattach the lifting hook to the turkey hook. Carefully lift the turkey out of the oil and hold the turkey over the pot to allow any oil trapped in the turkey cavity to drip out. To check the temperature, place the turkey on a rimmed baking pan, and insert an instant read thermometer into the thickest part of the thigh, making sure the thermometer doesn’t touch bone. Let the turkey stand 10 minutes to allow any residual oil to drip from the turkey. Transfer turkey to a cutting board. Loosely tent with aluminum foil and let stand 10 minutes before removing the turkey hook and carving. To keep the oil, allow it to cool overnight. Strain the oil, return it to the original bottles and refrigerate up to 2 months.